When I first saw that the schedule for Awesome Games Done Quick listed the original Pokémon games with an estimated completion time of "30:00," I had a feeling we were going to see something ridiculous today. And we sure did. 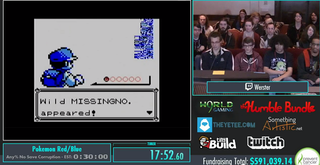 It took just 21 minutes for speedrunner Werster to rip through Pokémon Red/Blue this afternoon, methodically breaking the game in all sorts of ways in order to get to the Hall of Fame without beating a single boss. Granted, I have no idea just how any of this happened, but it is impressive nonetheless, thanks to some insane glitches ranging from the classic MissingNo bug to an exploit that lets you walk through buildings and walls. You can watch it all right here. Skip to 20:35 if you just want to see how it ends.